I’m always curious about beauty boxes, there are so many around at the moment it’s hard to know which are worth purchasing. 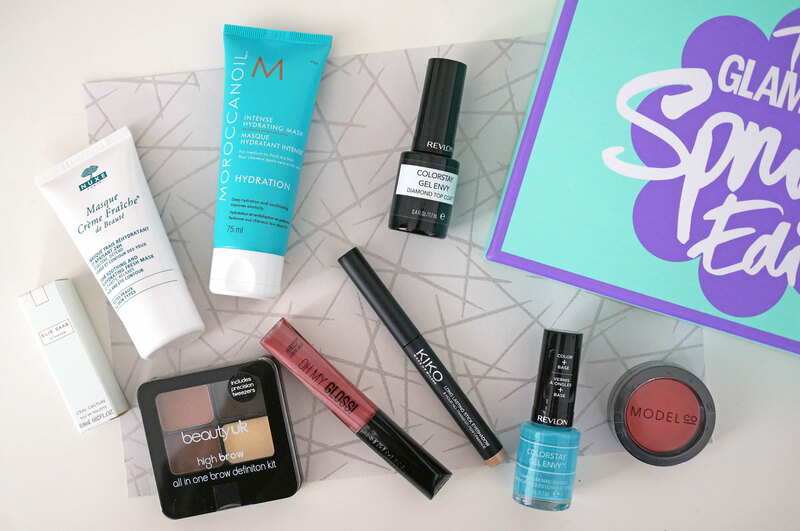 I’ve reviewed Wantable in the past, and more recently Glossybox and Lookfantasitc, so when Latest In Beauty offered to send me their latest ‘collections’ box, the Glamour Spring Beauty Edit, I snapped up the chance as quickly as I could! I haven’t tried LIB boxes before so I was excited to find out what the Glamour box was all about! So basically Alessandra Steinherr – Glamour Magazine’s Beauty Director, has chosen nine must-have products for the season to go in this box, worth an amazing £99.00. This box contains an impressive eight full sized and one sample size product covering beauty, hair and nails, as well as a 12 month subscription to the print and digital versions of Glamour magazine – amazing! I have to say it did seem a bit too good to be true, so when I was competing the online form with my details I was kind of waiting for a page to come up asking me for my bank details, but nope! I just entered the code on my voucher and instantly received a confirmation email. Awesome! I’m looking forward to the first issue arriving in my letter box! An impressive list hey!? There’s a couple of brands here that I haven’t heard of before so I couldn’t wait to get stuck in! So, starting from the top we have the Model Co Creme Rouge – now Model Co I’m sure I’ve heard of, but I haven’t had a chance to try any of their products. The Cheek & Lips in Just Peachy does look slightly intimidating but it actually comes out as a pretty sheer shade which can of course be used on both cheeks or lips, it’s great for a tint of colour. I’m not going to go into detail about the Nuxe Mask, you know I love it! I think this will be my third tube! Morocconoil is a favourite haircare brand of mine and has been for a while, so I was very happy to find the Intense Hydrating Mask in the box. This gives deep hydration to improve texture, elasticity, shine and manageability, and it’s going straight on my bathroom shelf! Beauty High is another brand I’m not familiar with, I don’t even recognise the name! The Brow Kit contains three brow powders and a clear wax, as well as a brow brush and tweezers. This is a ‘one size fits all’ product and I agree it should suit most complexions – except for very dark. It’s extremely similar to my MUA Brow Kit and gets a big thumbs up from me. Next is the Rimmel Oh My Gloss Lip Gloss. This is a lovely, every day shade that would suit most skin tones, and it’s not sticky either which is a bonus. I’ve popped this in my makeup bag for when I’m out and about. I was also really excited to find a Kiko product in the box too. I’ve only just started using Kiko cosmetics and I’ve loved what I’ve tried so far, and this Lasting Stick Eyeshadow is definitely no exception. 07 is a gorgeous light champagne gold shade that’s super creamy and easy to apply, and it set really well too. If you have problems with eyeshadow creasing or just wearing off throughout the day, I’d highly recommend you try these sticks. There’s also a Revlon Colorstay Nail Enamel in 320 Full House, which is a beautiful bright opaque turquoise colour. I haven’t tried Revlon products for years but I have to say I’m pretty impressed with this polish. It give a gorgeous opaque colour and the Diamond Top Coat leaves a high gloss finish – that should last. I’ll have to report back on that though! Overall I’m really impressed with this box, it’s a complete bargain for £16.99 from Latest In Beauty and I’d definitely recommend snapping one up! Love that nail polish shade! It’s the perfect shade for Spring/Summer! That is a total bargain!! Looks like it’s packed full of great items. Wow, some fab products in there and seems like a good deal for the price.